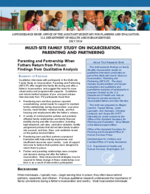 This brief presents findings on family life during and after a father’s incarceration based on qualitative interviews conducted as part of the Multi-site Family Study on Incarceration, Parenting and Partnering (MFS-IP). Qualitative and mixed-method analysis of pre- and post-release interview data from 170 participants found that reentering men and their partners reported overwhelming, unmet needs for support to maintain family relationships during incarceration, overcome trauma, meet families’ material needs, and find housing and employment after the father’s release. These findings offer new insight into policy and intervention approaches that could better support families during incarceration and reentry. Further, they suggest new strategies for future research to understand family relationships in communities affected by incarceration and evaluate intervention effectiveness.